You have probably never heard of Bill Sims but in 1918, he was the Vice Admiral of the U.S. Navy, and everybody knew his name. In the late 19th century little boys began wearing sailor outfits with middy tops – shapeless shirts with open necks and broad collars trimmed with rows of braid. Women’s swimwear also took on the sailor middy top style. The nautical theme suited the beach, and the unstructured top provided ease of movement for swimming and all forms of sporting activities. 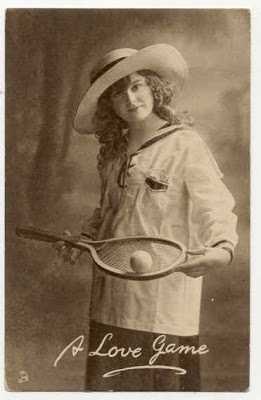 By the 1910s middies were standard apparel for schoolgirls, worn with knickers or a pleated skirt, for gym class. Manufacturers were competing for dominance in the middy market, and one of the most successful was sold under the folksy, friendly sounding name of Bill Sims but that name was actually inspired by Vice Admiral William Sowden Sims. William Sims was born in 1858 in Port Hope, Ontario, Canada to American parents. At the age of 18 Sims entered the U.S. Naval Academy and then served at sea for 17 years. 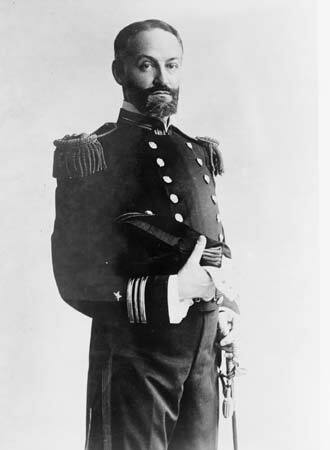 After postings as naval attaché to U.S. embassies in Paris and St. Petersburg, and returning to sea during the Spanish-American War, Sims wrote a series of reports criticizing U.S. ships and naval marksmanship. Sims was called to Washington by Theodore Roosevelt to oversee improvements in naval gunnery. Sims was promoted to rear admiral and made head of the Naval War College and was reputedly beloved by younger officers who affectionately referred to him as ‘Bill’. When the U.S. entered the Great War in April 1917, Rear Admiral Sims was promoted to Vice Admiral. He played a leading role in the development of the convoy system to protect Allied shipping from submarine attacks. After armistice, Sims resumed his post as the head of the Naval War College until his retirement in 1922. It was during this time after the war and before his retirement that a line of middy blouses with his name first appeared. Clothing manufacturers were becoming aware that brand names meant something in the marketplace, and a recognizable ‘celebrity’ could lead to better sales. However, it is doubtful Vice Admiral William Sims ever saw any money for the use of his informal name for the line of middy blouses. Although the shapeless middy slowly fell from fashion and gym uniforms became more streamlined, nautical styling remained a popular sportswear motif and was revived in mainstream fashions into the 1980s. 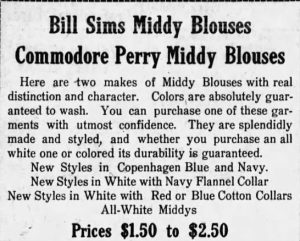 The Bill Sims brand survived several decades, but in different forms of clothing, from smocks to poly-cotton day dresses, until nobody knew who ‘Bill Sims’ was anymore, probably mistaking the name for the owner of the company. 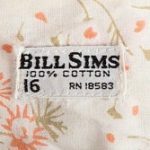 The last garments to sport Bill Sims labels were made in the mid 1970s. Thanks to Carrie Pollack of Cur-io Vintage for finding and sharing the Bill Sims information. This entry was posted in Celebrity brands. Bookmark the permalink. What is a Channel 1? 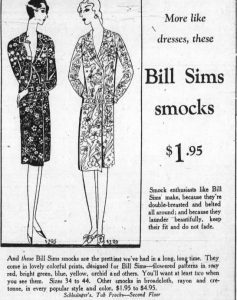 I recently bought a “Channel 1 by Bill Sims” dress and loved reading about him here. Thank you for the insight!